Supply chain sustainability and responsible procurement are critical to making global goals local business by ensuring that the extension of a company’s operations, products and services can support the realities of our planet and better serve markets both today and in the future. However, corporate supply chains are bigger and more complex than ever before. Open markets have enabled companies to source materials and outsource production to suppliers in developing and emerging economies. When done right, a global supply chain can deliver significant benefits to companies in the form of reduced costs and enhanced profitability and shareholder value. It can also contribute to much-needed economic and social development, resulting in higher standards of living for millions of people (learn more about the business case). When supply chains are done wrong – by not taking into consideration the environmental, social and governance (ESG) performance of suppliers – companies leave themselves open to significant operational and reputational risks. Impacts on people and the environment can be substantial and severe. See the Roadmap for Integrated Sustainability for further information on how different functions can be engaged in developing and implementing sustainability strategies within companies. In today’s globalized economy, outsourcing business operations doesn’t mean outsourcing responsibilities and risks. Responsible companies understand that they have an important and very active role to play in managing the environmental, social and economic impacts of their supply chains. Yet, extending sustainability throughout the supply chain is often considered the biggest challenge to improving a company’s sustainability performance. Today we see that businesses are taking a number of steps to address these challenges. Adopting innovative solutions is helping companies not just address the risks to their supply chains, but also contributes to increasing labour productivity, reducing costs and the use of resources and increasing efficiency – all while meeting evolving customer and business partner requirements and innovating for the changing market. Collaborative relationships, including with suppliers and industry collaboration. 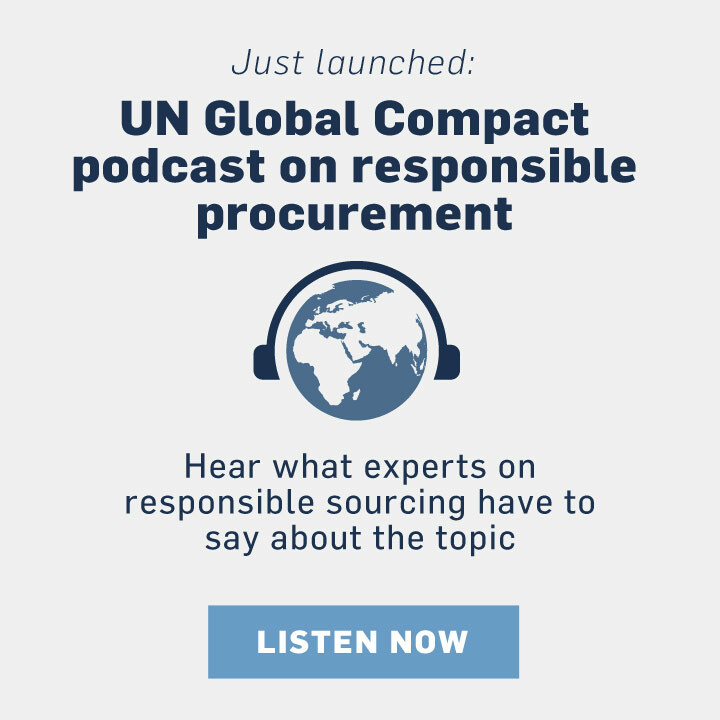 See how to collaborate successfully [SDG 17], and how collaboration can help tackle climate change [SDG 13], transform labour conditions [SDG 8], and help make supply chains more sustainable [SDG 15]. Traceability, for MNEs and SMEs, to advance sustainability in the supply chain. Learn more about the world’ s first guide on traceability, and how traceability can be used for sustainable fishing [SDG 14], and to solve deforestation concerns in the palm oil and paper industries [SDG 15]. Building more inclusive supply chains, by sourcing from previously underused suppliers such as SMEs, minorities, women-owned businesses, indigenous peoples etc. Supplier diversity enhances resilient, sustainable and adaptive supply chains [SDG 12], improving the competitive advantage of your company and adding to the bottom line [SDG 17]. Being better prepared to address critical issues such as forced and child labour, and meeting emerging standards and legislation. Read more about the role of emerging legislation for stopping human trafficking and forced labour [SDG 12]. Digitization of supply chain processes. Digitization can enhance performance, tackle potential risks and increase transparency [SDG 9].